Many of the attributes of the koi symbolize several lessons and even trials individuals often encounter in life. Koi fish was painted step by step with small paintbrush. 3-D fish hand painting in the resin and black pottery bowl. This is an original ink block print of a red rooster with red ribbon trim. I hand carved the lineoliun block of the rooster and used red fabric dye to print. The pillow is hand sewn original and one of a kind. Chinese Papercuts -- Small Set (Zhou) These paper cuts are all handmade in China, where paper cutting has been a traditional folk art dating back to 105 A.D. The pictures are carved from special, tissue-thin rice paper, then hand-painted with bright Chinese ink. They are cut out in the inside as well the edges and thus stand-out against any background. Each motif is an unbroken, continuous piece. These paper cuts can be used to create greeting cards, decorate photo albums, make bookmarks or design a poster. Each set of paper cut has its own special design. This is a machine-made embroidery reproduction of a famous painting with silk mounting, like a mat. Embroidery: 12 x 12" (31 x 31cm). Chinese Paper Cut - Large piece (Chen) Red These paper cuts are all handmade in China, where paper cutting has been a traditional folk art dating back to 105 A.D. 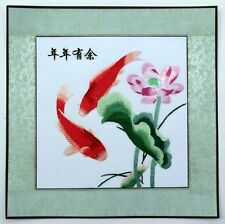 The pictures are carved from special, tissue-thin rice paper, then hand-painted with bright Chinese ink. They are cut out in the inside as well the edges and thus stand-out against any background. Each motif is an unbroken, continuous piece. These paper cuts can be used to create greeting cards, decorate photo albums, make bookmarks or design a poster. 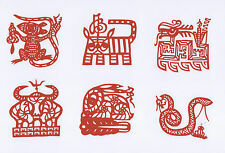 Title: Year of 12 animals in Fortune word (Red Color) Size: 20 x 17 cm (7.9 x 6. NEW DESIGN ACEO! ACEO (Art Cards Editions and Originals). Surface: Watercolor paper 300 grams. Technique: Watercolor. Original handed painting, not print. Due to difference of monitor, the picture may not reflect the actual color of the item, but it is original picture no retouch. Bird ACEO by Wichai. Surface: Watercolor paper. Technique: Acrylic, colored pencil. This is an original handed painting, not print. Due to difference of monitor, the picture may not reflect the actual color of the item, but no retouch. ACEO ORIGINAL(13pcs COLLECTION) mouse wildlife whimsical painting NO RESERVE!! Watercolor/acrylic/gouache paint on watercolour paper. MOUSE ACEO - NO RESERVE! "Dainty wildlife collection". - This is an original painting (not an "edition"/print). Original art by Shekainah Jean Ohman. ACEO (Art Cards Editions and Originals). Technique: Watercolor. Surface: Watercolor paper. Original handed painting, not print. Due to difference of monitor, the picture may not reflect the actual color of the item, but it is original picture no retouch. William Merritt Chase An Italian Garden Painting repro 24x36"
Title:An Italian Garden. High Quality Oil Painting on Canvas,Genuine hand-painted. We have over 100 contracted artists to paint fine Oil PAINTINGS of the Masters Works.Most of our artists have long history of precision in detailed replication of original art. Surface: Watercolour paper 320 grams. ACEO Painting on Paper. This is an original handed painting, not print. Technique: Acrylic 100%. Due to difference of monitor, the picture may not reflect the actual color of the item, but it is original picture no retouch. We strongly suggest that you watch a video on this step. Again, it's not complicated. It is very straightforward. You will need stretcher bars, wood glue (optional), a staple gun with staples, and canvas pliers. Surface: Watercolour paper 300 grams. ACEO ( Art Cards Editions and Originals). Due to difference of monitor, the picture may not reflect the actual color of the item, but it is original picture no retouch. ACEO Print. SUPER KITTY. This is an archival print of an original illustration. These prints are vibrant and fade resistant up to 100 years in an album. children’s trade books, magazines, and greeting cards. Hand painted oil painting nice animals red horse & her baby Foal little dog 36"
William Merritt Chase Still Life with Cockatoo bird parrot Painting repro 24x36"
Title:Still Life with Cockatoo bird parrot. High Quality Oil Painting on Canvas,Genuine hand-painted. Have you always wanted a certain painting, but not been able to find it anywhere?. The chances are that Refineon Studio will be able to reproduce it for you from any photos. Surface: Watercolour paper 300 grams. Original handed painting, not print. Technique: Acrylic 100%. Due to difference of monitor, the picture may not reflect the actual color of the item, but it is original picture no retouch. Surface: Watercolour paper 300 grams. THE CAT WITH THE HILL VILLAGE CLOTHE IN THE NORTHERN OF THAILAND. HOT COLLECTION & NEW CREATIVE IDEA! Original handed painting, not print. Due to difference of monitor, the picture may not reflect the actual color of the item, but it is original picture no retouch. Hand painting by artist Natalja Picugina. on watercolour paper. Tiger Fantasy. signed by Natalja Picugina. ACEO Print. A friendly kiss. This is an archival print of an original illustration. These prints are vibrant and fade resistant up to 200 years under glass and up to 300 years in an album. Nicole Wong's illustration have been featured in several. "White Wine Westie". By purchasing this item, you agree you will not reproduce this image in any way without my permission. ACEO Print. This is an archival print of an original illustration. These prints are vibrant and fade resistant up to 100 years in an album. All rights to this work are reserved solely by the artist, Nicole Wong. Surface: Watercolour paper. The Cat with Strawberry Pancake. HOT COLLECTION & NEW CREATIVE IDEA! Original handed painting, not print. Due to difference of monitor, the picture may not reflect the actual color of the item, but it is original picture no retouch. My art is also part of the Smith Callaway Banks art collection, Jim Massey Collection and in the collections of many other notable collectors around the world. I'm starting to show on the live circuit again watch for upcoming shows. It is a small painting, about the size of your palm. This painting is hand painted on rice paper. It is mounted on paper to make it smooth and strong. Title: " Pig, Quick sketch ". Presenting a new original watercolor painting from the artist, Natalie Komisarova. Materials: watercolor, paper. For many years I’ve been engaged in painting. I am a graduate of the Academy of Arts and professionally trained in painting and drawing, as well as graphic design. Cats In A Line" Red Sculpture Picture Frame Mom & Baby Kittens Albert Dubout France Offered here is a picture frame/statue adaptation of the famous Les Chats de Dubout (The Cats of Dubout). It is made from heavy parastone resin with hand painted color details. It is part of the highly collectible Parastone Mouseion 3D Collection designed in Europe to adapt famous paintings into three-dimensional form. It includes a picture card of original artwork by Dubout and a description in multiple languages. Original oil painting by Heidi Shaulis. Charlie at Kaaterskill Falls. This painting imagines Charlie hiking there to take in the natural beauty and try out his new fishing pole during the annual Running of the Goldfish.